My 30 day challenge for the month of September was to 'stay away from carbonated drinks'. I have always loved drinking Coca-Cola (and other aerated drinks) and been hooked on to it for so much time that my dentist began to complain. I used to drink at least three cans of cola on an average day and this was the case for quite a long time. I could actually differentiate between Coca-Cola and Pepsi. So to try and beat this habit, I embarked on this challenge. Initially during the first week and a half it seemed unpalatable, particularly when the weather here is so hot during the day. I substituted my regular choice of drinks with iced tea, cold chocolates and smoothies. Eventually, it turned out better than expected and I was able to stay away from the cola for the entire month except for one instance at the F1 Singapore GP, where the only other alternative to coca-cola was beer. This challenge might seem a little mundane but the idea was to break out of this habit. I am glad I did. Its been more than a month now and I still haven't really felt the urge to pop a cold one. Remembering the events of a day, particularly something that happened 10 years ago is very difficult. But sometimes, the memory is so strong that it just seems to be cemented in your mind forever. 3rd June 2001 was one such day for me. It began a new phase in my life. It was my first day at a new school - St. Peter's, an Anglo-Indian boarding school located in the beautiful town of Panchgani, about 265 kms from Mumbai. More than a hundred years old, the institute serves as an Alma Mater for thousands of grateful alumni who are now in different corners of the globe. From kindergarten to primary school to secondary school to college years later, I have attended a few educational institutions in my life. But none of these transitions has had a profound impact on me as much as my enrollment into St. Peter's School in the summer of 2001. I vividly remember helping Dad pack my aluminium trunk, stuffing it with all the things we purchased as per the school's requirements. Newly stitched shirts and pants, new shoes, raincoat, a mattress rolled into a gigantic holdall and a million other things... everything was packed a week before I was scheduled to leave. The school required all the new students to report on the 3rd of June before 6.00pm. I can vividly recall the emotional farewell with Mom (who kissed me and wished me luck) but I don't really remember the long journey from Mumbai to Panchgani. Upon reaching school, Dad and I found out that I was assigned to Bason Hall. This was my dormitory for the first year and I was under the care of a very strict and caring matron - Mrs. Peters. It was a rainy day and I could hear the sound of the rain pelting on the asbestos roof of Bason Hall. Rains in Panchgani would ofter get very heavy and the weather at that time quite reflected my distorted state of mind. I was very apprehensive. I was only 11 years old and this was my first time away from home. After we found a vacant bed and locker, we unpacked all the stuff from the trunk that we had carried along with us. I also made a friend - Gaurav Suri. Like me, he was a second generation Peterite (My father attended school at St. Peter's. He was from the class of 1973). Suri would be a great friend for the next four years of my life there, and to this day, we maintain that great friendship. I quickly changed into the school uniform as it as time for dinner. I met Mr. Martin at the linen room and he gave me my striped tie and scarlet cardigan. I had my first meal at school sitting beside Suri. His cousin, Himanshu Suri, had been at St. Peter's since class 3 and was a lot more familiar with the place. He helped us a lot in settling down in the initial few months. Comradeship must still be found... "
Dad left later that evening. The first night, I was an emotional wreck, I missed my Mum terribly and cried for a long time. Mrs. Peter's heard me crying and spent some time talking to me. After she put me to bed, I cried some more until I eventually fell asleep. The next morning was far better. At school, we were addressed by our respective surnames and I was called 'Menon'. Till date most of my friends still call me 'Menon'. Each student was sorted into one of four houses (all named after former principals and founders) - Ashlin (green), Cornwill (red), Drury (blue) and Rowan (black). My Dad was from Drury and so naturally I was asked to remain with it. I was happy to be a part of it under the care of Mr. N. A. Khan. I am a proud Druryite who still cherishes the house motto 'Facta Non Verba' (Action not words). So began the most beautiful period of my life. For the next four years, I entered the most creative periods of my entire life. I was able to explore my strengths and weaknesses and grew up understanding myself a whole lot more. Skills that would transform me from a mama's boy into a responsible young man ready to face the world. I was lucky to grow under the loving care of great teachers who helped us not only within the classroom, but also outside its four walls. Students don't become academic lovers at St. Peter's, they grow into men with character. There were a lot of memories with the place and every visit to Panchgani brings back fresh ones. 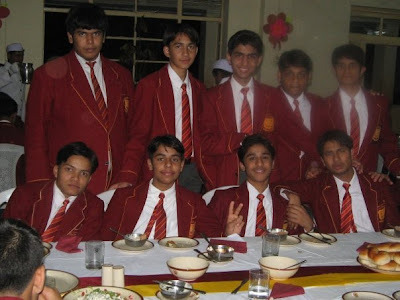 I met fellow students who came from different parts of India who would become my best friends for life. We played together, we laughed together, we studied together and we grew up together. I had excellent classmates in the form of Priyam Banerjee, Kadam, Steve, Ciril, Purav, Ash, Pande, Akshay and several others, each of who taught me something unique and exciting. They are the closest friends I have ever made and the friendship just seems to grow stronger and stronger as the years roll on. Thanks to the internet, although we are on different continents, we are still in contact with one another. Of a joyous needless ways..."
I waited quite a while for Blogger to role out its new 'draft template', a new UI loaded with better features, to post this update on my next 30 Day Challenge but I guess it may not be happening anytime soon. My 30 Day Challenge for February was 'to walk home daily from college'. Since February 2011 has only 28 days, I began this challenge on the 31st of January and extended it to the 1st of March. This challenge would have been a 20 day challenge because theres no school on Saturdays and Sundays, but I did my walking on weekends too and completed all 30 days. The distance from my school to my block is about 2 miles which roughly takes me about 35mins to cover (Approx speed = 3.5mph). With the help of a walking calorie calculator I was found out that I burned an average of 186 calories per day. This means that in 30 days, I burned roughly 5580 calories by walking home every evening. For me, the benefits did not end there. A typical one way trip home from school by bus costs me $0.81. Over a period of 30 days, I ended up saving $24. All it took was a little music and some podcasts that I follow quite regularly. I did not attempt this challenge with the aim of saving money or losing weight (I play soccer regularly and my BMI is within the 'healthy' range). It was mainly aimed at cultivating some self discipline and see if I could keep up with it for 30 days. It was hard though, mainly on weekends when I had no particular reason to step out from home. 30 days later, I have eventually liked walking, particularly in the evenings, because it gives me time for myself, to reflect on the day's events and the pleasant weather is a bonus. All in all, I am happy with the way this challenge had progressed and hope to continue walking home in the days to come. Happy New Year everyone! My 30 Day challenge for January 'To take a picture everyday' was not much of a success. mainly for two reasons. Firstly, I was a little busy with an important school project which kept me occupied for most of the month and secondly I didn't really travel that much and my daily routine and travels were almost redundant. There was nothing really interesting to photograph. However, I did remember to take photographs during the few times that I traveled. I will be travelling in March and I intend to redo this challenge, this time with better focus. As for the photos that I took this past month, here they are*. I managed to take only 17 from my target of 30. Some of the pictures taken at night are grainy too. Apologies. I shall remember to carry, with me, a better camera next time. *Update: When Blogger was updated to the newer version, my embedded slideshow broke as a result. So I had to add a link to the G+ album instead.